Spent five days at a conference this week. It was a pretty good conference and it was wonderful to have reunion with people I usually only see at that conference. Home in the country again, it’s interesting to catch up with what’s been going on: cattle that have been out and put back in (this I couldn’t see for myself, but had to be told by those who got them back in); limbs that have fallen in storms; wicker chairs that have blown off the porch during one of the storms that produced a total of four inches of rain while I was gone; more toads now; some plants have grown by half their size and weeds that had been pulled before I left are back again. But the thing I notice most is the knot in my stomach, the anxiety in my heart. Try as I might not to, I got caught up in the politics of the conference. Not that I’m a political player, but just noticing the reality of politics and how much it influences our community and how in little and big ways it impacts my life presented me with an anxious heart and a knot in my stomach. Politics can become our daily diet and it affects us. Sitting on the porch this morning, I try to let it all go. There’s a small green toad hopping on the porch floor. The wood bees are buzzing, doing their work. The birds are gloriously vociferous. The wind is blowing through the huge hackberry tree. I hear the steady throbbing of crickets. 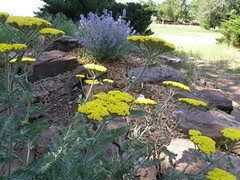 Yellow yarrow and lavender have not faded one bit. A barn swallow nabs a wood bee, right in front of me. The cow confined to the corral bleats. The toad is crawling through the mulch and stones in the rock garden. The peaceful state of my heart is found again. In the evening at Turtle Rock Farm we like to show videos that relate to our mission of sustainability, spirituality and healing. Earth Cinema Circle offers such DVDs. They are a community dedicated to the health and healing of the planet. Sunday, after going to a meeting of organic gardeners where they were talking about bio-dynamic agriculture, I watched a recent DVD from Earth Cinema Circle, “How To Save The World: One Man, One Cow, One Planet.” Produced by Cloud South Films, this movie is the story of Peter Proctor, a farmer from New Zealand working in Bio-dynamic agriculture since 1965. 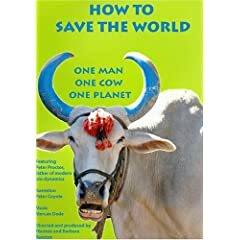 He has now moved to India and is working with farmers to change the way they farm in that country. As a member of Earth Cinema Circle I receive a DVD every other month which includes environmental films that educate, entertain and inspire people into action. Click here to visit their website and learn more. Here at Turtle Rock Farm, we have been composting for some time now. But it was in a plastic square composter. We never turned it because we couldn’t figure out a way to do it. We wanted composters that could be turned easily. So we bought 30 gallon plastic barrels, PVC pipe to go through the middle, wood for a stand, black paint and built our own. It only took a couple of hours! We are eager to get them filled. Let us know if you’d like to learn more about building your own composter! Late last summer I had a praying mantis on the screen door here at Turtle Rock Farm. I thought maybe it couldn’t get out, so I opened the screen. I watched and enjoyed it for four days. On the fourth day I discovered a rectangular mass on the screen. I thought maybe it was an egg case from the praying mantis. But I didn’t know. So I left it there and looked at it from time to time and waited. I had no idea if it was really anything or when something might happen. This morning I was rewarded with hundreds of little praying mantis. Patience is important in nature and in the end is often rewarded in a magnificent way. If you are interested in our Living in the Moment retreat, you’ll want to visit Turtle Rock Farm on July 12 for our Experiencing The Spirit Within retreat. Have you ever met a person who seems to be at peace no matter that there is chaos all around? This retreat will offer spiritual practices that help a person be in touch with and live in constant contact with the Spirit of God within. The day will be spent learning these spiritual disciplines as well as practicing each one. Our spiritual director and retreat leader Pat Hoerth will lead this wonderful program. You are encouraged to arrive after dinner on Friday, July 11 to give yourself time to relax and be prepared for the retreat on Saturday, July 12. Visit our website to find out more or click here to register for this spiritual retreat! There is never a more quintessentially Oklahoma wheat country experience than the spring, wheat harvest season. Right now, the wheat looks beautiful from the highway – the famous fields of waving grain: some varieties still green, some already turning beautiful shades of gold and bronze. Walk out into the field and the heads of wheat are long and have grown unusual numbers of spikelets (the places where the grains form.) Pick a head of wheat and open a spikelet and the grains are about half formed. It needs more cool days to form completely and harden into golden grains. Already, there have been 90-degree days, though there has been cooling as storms have built. Growing along with the wheat, there are other plants – mustard, bindweed, rye, goat grass – and, in some fields, rising above the wheat, the dainty cheat. These are weeds that bring down the value of the wheat, partly because when they get cut along with the wheat they add moisture to the content. So, here we are waiting for the wheat to fill, to ripen before it gets too weedy, before it gets too muddy for the combines to negotiate the fields. 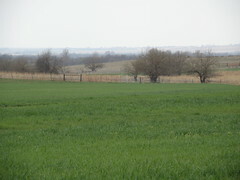 Historically, the wheat around here is ready to harvest about the first week of June. But this is also thunderstorm and tornado season. There is the daily threat of torrential rain, high winds, wheat-shattering hail. Yesterday, Kansas experienced 40-plus tornados and tornados are making their way across Oklahoma as I write this. Growing food is a noble, glorious gamble. Today is World Turtle Day. We like thinking about turtles because there are many around here. Growing up, we used to swim in these farm ponds and the dangers were leaches and snapping turtles. Leaches would come off; snapping turtles would take something off you. We had a healthy respect for them. Some Native American tribal people consider turtle an image for Mother Earth. “Turtle has a shell which is similar to the protection that Earth has employed for centuries as her body has been defiled,” write Jamie Sams and David Carson in their book about native animal symbolism, Medicine Cards. The species is older than dinosaurs, say the people at American Tortoise Rescue. They began World Turtle Day, in 2000, to call attention to the plight of turtles. And so today, at this time of year, when turtles are crawling out of hibernation, we take special notice of the turtle. We’ve seen them around here everyday for the last week. Various sizes, various kinds. I saw one still encrusted in earth as it walked across the driveway. A huge green turtle with a very large neck and head was making his/her way across the state highway. A large slider was beginning an adventure across our dirt road this morning. And a small box turtle has taken up residence in my backyard, for which I’m most grateful. Last summer, a guest was staying at our retreat center and took a morning and an evening walk each day. She saw armadillos at every turn, but hadn’t seen a turtle until one evening – it was a two-headed one. And so we think today about turtles and the environment. May they teach us their ways.